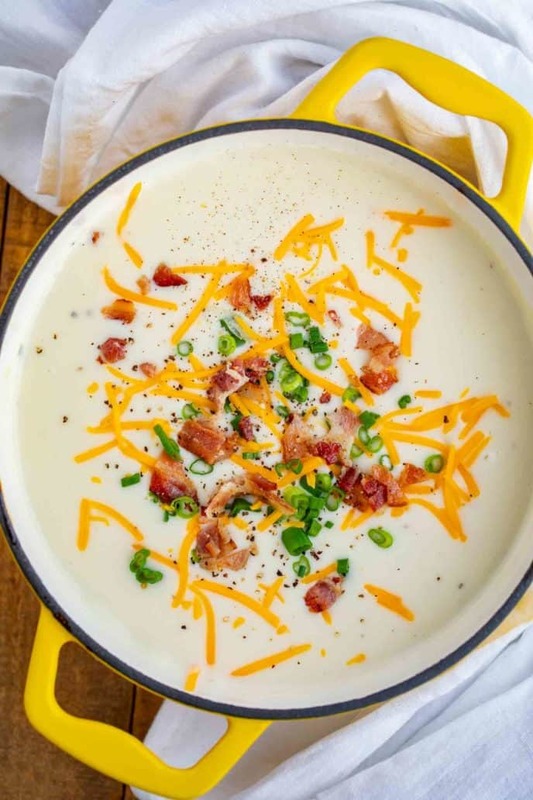 Baked Potato Soup is a one-pot recipe made with yukon potatoes, thick cut bacon, cream and topped with green onions, sour cream and cheddar cheese in under 30 minutes! 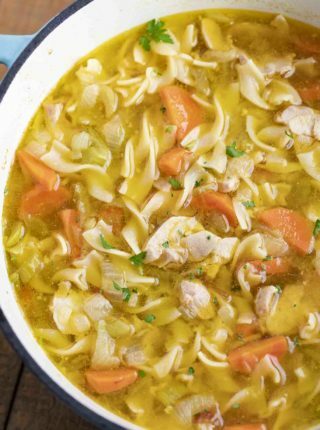 We love good soups in our house including Chicken Noodle Soup, Cabbage Soup, Taco Soup and Beef Stew and this Easy Potato Soup Recipe is no exception! It is comfort food at it’s best! Potato Soup sounds like a punishment, potato soup? But this isn’t grandmas boiled potatoes with some random vegetables like carrots and celery. This is the creamiest, silkiest potatoes in a chicken broth and heavy cream mixture thats been pureed until it is perfectly smooth topped with cheddar cheese, green onions, black pepper and sour cream. This is your ultimate twice baked potato in soup form, talk about comfort food. Or like those Loaded Mashed Potatoes you all love on the site, in Soup form. And if you love recipes on this site, please check out all the Soups on the site, soups are basically a love language of mine. 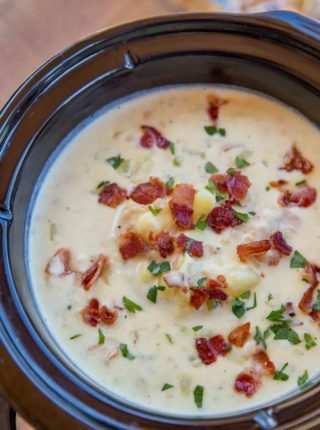 There are two schools of thought for potato soup. You can use Russet potatoes and keep the color of the soup more of a distinct PURE white or you can use yukon gold potatoes and create a creamier more golden colored soup. I prefer to use a yukon gold in most settings like my Slow Cooker Beef Stew or my Ultimate Pot Roast because the butter texture and firmness of a Yukon Gold potato is just heads and shoulders better than a russet (in my humble opinion). Can you swap out Chicken Broth and/or make this vegetarian? Yes! You can make this potato soup vegetarian if you swap out the chicken broth and leave out the bacon. You do not technically need either of the ingredients for this recipe. If you do drop the bacon from the recipe I’d suggest adding a bit more of a bold flavor from another source. Add more garlic, or perhaps leeks. Add ginger or maybe some additional spices. You could even take the soup in a sweeter direction and add half sweet potatoes and half yukon since you’re removing a savory flavor like bacon. Potato Soup is hearty enough to be most of a meal but it can be served with Garlic Bread, Cornbread, Dinner Rolls and a Wedge Salad. Can you make Potato Soup in your Slow Cooker? 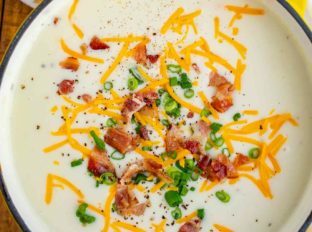 To make this potato soup recipe in the slow cooker cook the bacon in a pan then use the fat to cook onions as directed in the stovetop directions. Add the onions to the slow cooker with the garlic, potatoes, salt and pepper and cook on low for 4 hours. 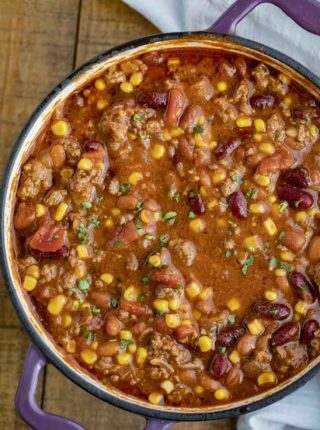 Add the butter and flour together in a bowl and mash them together until fully combined, add to the slow cooker after the 4 hours of cooking along with the heavy cream and cook an additional hour on high heat. Using an immersion blender, puree until smooth then ladle the soup into bowls and top them with bacon and additional toppings. To make this potato soup recipe in the instant pot cook the bacon in a pan then use the fat to cook onions as directed in the stovetop directions. Add the onions to the slow cooker with the garlic, potatoes, salt and pepper and cook on high pressure for 10 minutes. Release from pressure then mash the butter and flour together in a bowl and add to insert along with the heavy cream and cook on medium heat, stirring for an additional 3-4 minutes until thickened. Using an immersion blender, puree until smooth then serve topped with bacon and additional toppings. Make sure you boil the potatoes until they are truly fork tender. If they are undercooked the immersion blender will not create a silky texture no matter how long you blend it for. Using a potato masher will never make a silky texture like an immersion blender will. It will also take you a significantly longer amount of time. If you don’t have one consider using a blender in it’s place. If you’d like to make this recipe gluten-free replace the butter flour mixture with cornstarch to thicken the soup. You can use low-sodium chicken stock and lower sodium bacon in addition to cutting back on salt if you want to control the amount of salt in the recipe. Use the bacon drippings to cook your onions. I know it is a saturated fat instead of vegetable oil but the flavor in the bacon grease adds a TON of flavor. This isn’t the recipe to be trying to negotiate calories on. Instead of using heavy cream you can also use half-and-half as a low-fat option. If you do this you may need to use a bit more of a butter/flour mixture to create the same creaminess in the potato soup texture. Toppings like scallions, sour cream, cheddar cheese, bacon crumbles and black pepper are traditional but you can use alternate ones as well like croutons, sunflower seeds, chives, vegetarian bacon bits or chopped nuts. 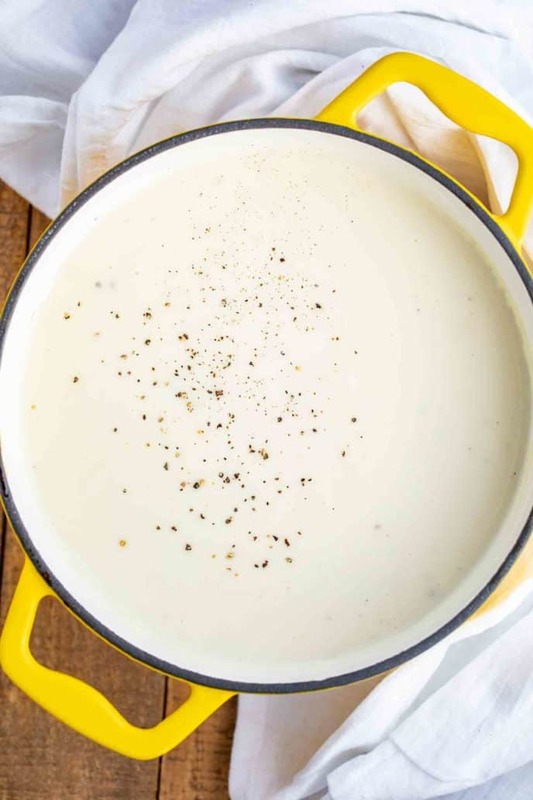 Looking for more recipes like this Creamy Potato Soup? 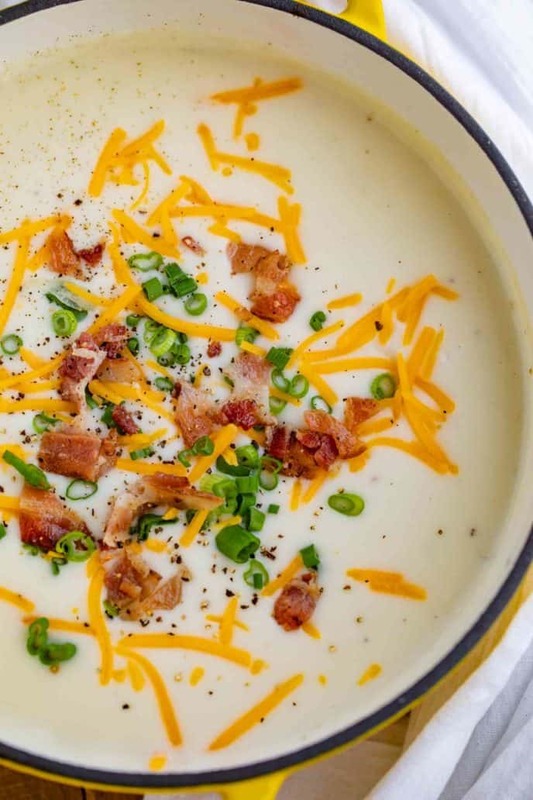 Creamy Potato Soup is a one-pot recipe made with yukon potatoes, thick cut bacon, cream and topped with green onions, sour cream and cheddar cheese in under 30 minutes! Add the bacon to a large dutch oven on medium heat and cook until crisp, then remove from the pan and add in the onions cooking until translucent, about 3 minutes. Add the potatoes and garlic to the pan and cook for two minutes then add in the chicken broth and bring to a boil then lower to a simmer and cook for 15 minutes. In a medium saucepan add the butter and flour and whisk together until melted and smooth for 1 minute then slowly add the heavy cream, salt and pepper while whisking until smooth. When the potatoes are fork tender, turn off the heat, using an immersion blender blend the soup to your desired consistency then mix in the cream sauce and bacon (reserving some bacon for the topping) and serve topped with sour cream, green onions, cheddar cheese and bacon. Oh, I agree, this is definitely not your grandmother’s potato soup!! I love how rich and creamy it is! So glad you enjoyed it, Pam! Thanks for the 5 stars. I like that you included instructions for making this in the Instant Pot. I’m going to try it! Glad you found it helpful. I hope you enjoy it! tasty looking soup! good tip about making sure the potato is cooked enough. This looks and sounds so tasty. I love all the flavors associated with baked potatoes so this is right up my alley. 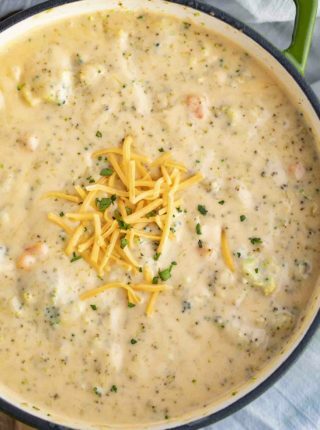 This soup is so incredibly creamy and delicious! I love how fast it is to make, too! 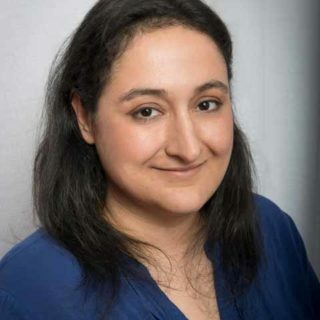 Thanks for coming back to let me know, Tracy!